Not to be confused with Fire Attack. 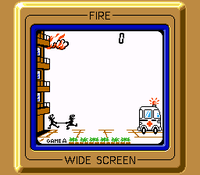 Fire is a Game & Watch game found in the Silver and Wide Screen series, released on July 31, 1980, and December 4, 1981, respectively. Remakes of it are found in Game & Watch Gallery, Game & Watch Gallery 3, and Game & Watch Gallery 4. This game has also been released as Fireman Fireman. It is also the basis of Mr. Game & Watch's up special move in the Super Smash Bros. series, as well as one of the interchanging layouts in the stages Flat Zone 2 in Super Smash Bros. Brawl and Flat Zone X in Super Smash Bros. for Wii U and Super Smash Bros. Ultimate. The alarm indicator for Fire is a fireman who is located above the ambulance and below the miss counter and swings his bell when the alarm goes off. He was originally planned to appear in Game & Watch Gallery, but he was scrapped from the game for unknown reasons. In the Super Smash Bros. series, he appears in the Fire layout of the Flat Zone stages, swinging his bell when it is about to change into a different one. People jump out of a burning building and fall down to get rescued. The player, controlling two men carrying a life net, must bounce the people off the life net to get them to the ambulance on the other side of the screen. If the two men catch a person, the player earns a point; people who have been caught bounce and must be caught again. People fall at different speeds depending on where they are. As time passes, more people will jump from the burning building, and they will eventually fall faster. If the two men miss one of the falling people, the person gets injured and runs away, and the player receives a miss. If the player reaches 200 and 500 points, any misses they have will be removed, and the people will freeze to make it easy to get them before they continue falling. The player receives a Game Over when they have three misses. In Game B, there are two ways to escape from the burning building, so it makes the game harder. Mario and Luigi attempt to catch Toads, Yoshis, and Donkey Kong Jrs. after they jump out the window of Princess Peach's burning castle. The catch is that different characters fall at different speeds. Yoshi Eggs also appear and contain either a Bob-omb or a Moon (Super Stars in the first game); the eggs will break open if they are caught or hit the ground. The player receives two points for catching an egg. If a Bob-omb reaches the vehicle, everyone, including the Mario Bros., runs away as the vehicle explodes, and the player gets a miss. If the Mario Bros. catch a Moon, the player receives five points. At 200, 500, and 700 points, Peach will appear and blow a kiss in the form of a Heart, which removes a miss if Mario catches it. In the Game & Watch Gallery 4 version, the time of day changes every 200 points collected. The Modern version also features music, with the tempo changing depending on the speed of the game. If the player selects this game in Game & Watch Gallery 4 yet does not start playing it, a humorous sequence plays. In particular, Mario and Luigi catch a Toad sent flying to the left and a Yoshi sent flying to the right, only to narrowly stop when discovering their next "rescue" was in fact a Bob-omb, which detonates inches from them, and are then forced to flee as a dozen Bob-ombs are raining from the sky. G&W Fire (07/1980) Many fans of modern handheld games will fondly remember the classic Game & Watch games they played years ago, like the intense challenge of Fire. Save people from a burning building using a trampoline, bouncing them to the waiting ambulance and safety. 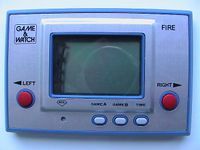 The Game & Watch series was a revolutionary experience in gaming when it first his shelves in 1980 with titles such as Fire. As people jump from the windows of a burning building, firemen run around underneath with a trampoline, bouncing them into the waiting ambulance. The port shown in Game & Watch Gallery 3 is reversed, which, according to the game, is due to an apparent mistake on the original Game & Watch systems. However, none of these reversed copies have yet been found by collectors. In the original versions, angels were used as miss marks. In the Game & Watch Gallery series, bandages replaced the angels. The original Silver version of Fire info page on In the Attic, a website dedicated to classic videogames. The Wide Screen re-release of Fire on In the Attic. This page was last edited on March 23, 2019, at 16:29.